This year I will get organized. Happy New Year, everyone! I’m so excited to jump into 2015, as I always feel so recharged at the start of the year. Maybe the two weeks of holiday vacation have something to do with that but I can neither confirm or deny that. This week, we’re going to be chatting a bit about my New Years Resolutions for 2015. I have a few of them, and I’m sure they are pretty universal, so I’m hoping by sharing how I’m planning on tackling my resolutions, we can share some of what works and what doesn’t. This year, I’m holding my self accountable too. Get ready for monthly updates on how I’m doing with my resolutions so we can track what worked and what didn’t (and what fell by the wayside after January 6) together. Ready for this adventure that is 2015? Let’s get started! 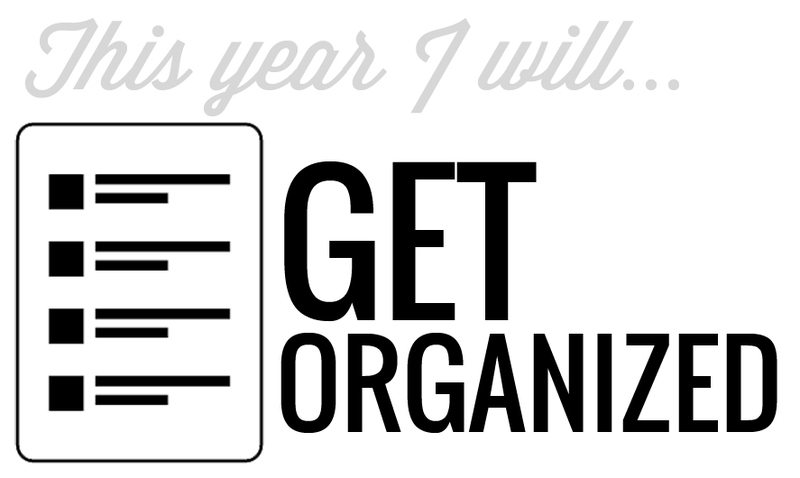 Resolution #1: This year I will get organized. I’m certain I’m not the only person out there feeling like their house looks like an episode of Hoarders. I also hope I’m not the only person in the world that writes to-dos or messages on whatever is lying around, ending my day with a stack of napkins, receipts, and post-its instead of a nice, neat prioritized list. Those are just a few of my many issues in the topic of organization. Let’s break it down further. Lacking Organizational Tools. This is more of an issue for my personal organization. Once a great user of our homekeeping binder that tracked budgets, cleaning schedules, and meal plans, I’ve lost my motivation for it somewhere among all the disorganized mess that’s going on inside my brain. I also was in desperate need of a planner–something to keep track of my daily meetings, appointments and to-dos, but also something where I could plan out blog posts. The first thing I’m trying is a few complete room makeovers. Our dining room as of January 1 is now our play room. I’m hoping that in giving all the toys a forever, organized home, they will stop making a mess of the rest of the house. Our guest room/my office closet was another black-hole of clutter. We frequently used it to hide away whatever we didn’t have a place for. As of Saturday, that baby has been cleaned out and organized. Everyone collectively light a candle and cross your fingers that that baby stays as beautiful as it is now. I also decluttered my desk. I’m someone that likes a lot of stuff around them, but I’m beginning to find it all distracting. It looks so beautiful now, I desperately would love it to stay this way! On the personal organization front, I reassembled our Homekeeping binder and I make a point of looking at it daily. I may not actually do all the cleaning I’m supposed to, but hey. At least I’m looking at it again. Before Christmas, I also ordered a Simplified Planner from Emily Ley. Let me tell you. This planner is BOSS. It has a space for everything and everything has its place. I’m able to keep track of appointments during the day, as well as all the to-do tasks I have going on. There’s a space for me to record what’s for dinner (so I remember to take something out of the freezer), and a notes area to jot down which blog post is going live that day. Above all else, it’s beautifully designed. Well, there you have it. My first New Years Resolution. For more of my favorite organizing tips, visit Ally Jean on Pinterest! Share with me in the comments your favorite organizing ideas or what you’re trying. I’d love to hear your best tips! Are you pledging to get organized this year?